So last week, I finally got my brows microbladed. I thought I'd do a little round up post of what microblading is, what my experience was, and include my before and afters! Microblading is essentially a type of semi permanent makeup - not a tattoo! Pigments are used rather than ink, and does not go as deep into the dermis of your skin. With microblading, a hand held pen is used, rather than a motorised tattoo device. You can expect microbladed brows to last 1-2 years. This will depend on your skin type (drier skin will cling to the pigment better and therefore will last longer) and how well you look after them. A tiny blade is used to create hair-like strokes in your brow, to create the illusion of fullness and give them more shape. Prices for the treatment varies, but I'd say the average is £200-£250. 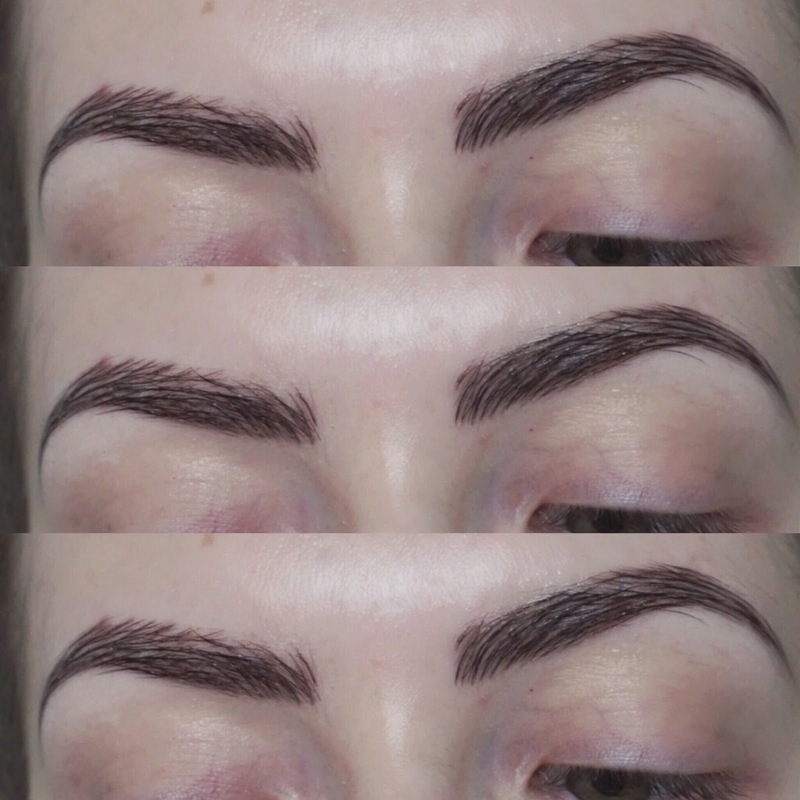 Firstly, my beautician pencilled in my brow shape with a removable pencil, so we could both see where the microblading was going to go, and how my brows would look. This way, I could easily ask to change things and get the shape exactly how I wanted it. This is customised for each client, and it is measured precisely to make sure they are as symmetrical as possible. Once I was happy with my shape, we picked the best ink colour for my brows to match my existing brow hair. Then, she began to actually microblade. I did have numbing cream on before this began, but you can definitely still feel it. Whilst I wouldn't describe it as painful, it's definitely a little uncomfortable and it does sting a little bit after a while. I have a pretty low pain threshold though, and so if I can manage it, I'd say most people could too! The actual microblading took around 45 minutes for me. My brows weren't too sparse to begin with though, so it could take much longer if you have little to no hair. Once it was done, she put a liquid that acts as a 'liquid plaster' over the top and I was good to go! As for aftercare, you have to wash your brows with a special shampoo every 2 hours on the first day and apply lots of aftercare cream. This will stop any blood drying and keep them clean so they don't scab over. The first night that you have them, you put plenty of cream on then apply some clingfilm over the brows (attractive, I know!) to protect them. After the first day, you no longer need to wash the brows, and you just apply the cream 4-5 times a day and overnight (clingfilm no longer needed!) for 5-7 days. Once that's done, they should be fully healed. One thing I should mention is that during this time, you can't really wear makeup on the brow area, to avoid irritation and hinder the healing process. For me, this has been especially hard haha! You should also avoid saunas, intense exercise, swimming etc. The final step in the process is a touch up 4-6 weeks after the initial treatment. As I haven't had this yet, I can't share too much about it, but it's basically to ensure you're still happy with the shape and the colour etc and add any final touch ups. Hope you enjoyed this post, and it was useful if you're thinking about getting your brows microbladed! If you have any other questions, message me or leave a comment below.